British Council Scotland is celebrating their 70th anniversary by spotlighting works from the British Council Collection that map the vitality and record the activity of just some of the artists who were born in, or studied, lived or visited Scotland in the last 70 years. Hamish Fulton describes himself as a ‘British walking artist’. He sees the act of walking as another way of seeing, a way to map and measure the earth beneath your feet and the sky above your head. It was in 1973 while walking the length of Britain, from Duncansby Head, the most northerly tip of Scotland to Land’s End in England, that Fulton decided ‘to only make art resulting from the experience of individual walks’. Studying at St Martin’s College of Art in the 1960s, Fulton was immersed in land and performance art. It was political. Art needed to be liberated from the confines of the gallery. Art could be performed and land could be your medium. Since this 1973 declaration, Fulton has walked through the UK, Europe and South America. 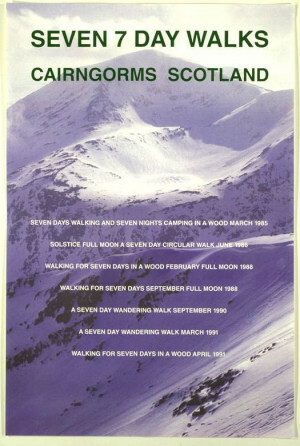 In the late 1980s and early 1990s, he embarked upon seven, seven-day walks in the Cairngorms. This massive, rugged and often capped in snow mountain range in the Highlands of Scotland is often described as one of the UK’s wildest landscapes. Importantly for Fulton, he does not gather physical artefacts while walking but writes notes and takes photographs. These are later distilled into an artwork in the studio. Seven 7 Day Walks is a distillation of his time walking in the Cairngorms. It is a screenprint, showing an image of a sheer, snow-covered mountain. This is overlaid with text. Succinct texts: full moon, nights camping. These words read from left to right, from start to finish, slow the eye down. The mountain is made visible. Today, in age where ever-faster travel seems the imperative, Fulton’s walks across the UK, Europe and South America are literally grounding. Metronome-like, Fulton gives a steady pace in a fast age.